Mastering cutting is not difficult, like so many other pursuits it is a matter of practice and patience. These basic principles apply to both fusing and stained glass work. When cutting glass you don’t actually “cut” the glass but run a score line down the sheet with yourcuttercutter. The glass is then snapped along the score line. It is a good idea to use cheap clear 1/8 inch window glass for practice. You can use newspaper or a short pile carpet square (preferable) from you local hardware shop as a cutting surface. Cutting requires about 4.5 to 5 pounds of pressure. If you have a kitchen scale use this to check out what this “feels” like. Place a piece of cardboard on the scale to protect you cutter and press down on the cutter and hold it for 10 seconds at 5 pounds. Repeat this a few times and try it with your eyes closed, check to see how close you are to 5 pounds. Before cutting, clean the glass to remove all dirt and grease.Handle sheet carefully at all times to avoid cuts. Always wear your safety glasses when cutting or snapping glass. When glass cutting stand/sit in a comfortable position with the glass sheet directly in front of you. Whenever possible cut on the smoothest side of the glass only. Using your favored hand hold the cutter vertically and place the cutting wheel as close to the opposite edge as you can. Once you have placed your cutter on the glass exert a steady even pressure as you bring the cutter towards you. Release the pressure as the cutter rolls off the glass. Remember, you only score a line once. Check your score line, it should be a very faint even line. Should the line be hard to see then you have not used enough pressure. If the line has glass chips or splinters then you are using too much pressure. If you wish, you can cut away from your body. This allows you see any line or pattern you may have on the glass, as your hand will not cover it. After scoring you need to snap the glass along the score line so that it snaps evenly. Place glass in both hands with your fists clenched and the glass under your thumbs, with the glass sitting on your index fingers and the score line in between as per the photo. Keep your elbows gently alongside your chest. 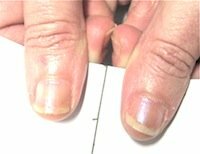 Start the break by pulling outwards; applying a quick snap by rolling your knuckles, this is all done in one smooth action.Use this method on small pieces only. Place the guideline on the pliers about 3/8 inch in from the edge and along the score line.Gently squeeze the pliers and slowly increase the pressure until the break begins to move along the score line to the other side. If the line does not reach the other side turn the glass and apply the pliers to the opposite edge until the glass separates. There are other methods than you can use when you become familiar with these basic approaches. You will find some additional information on this YouTube video. Once you master cutting skills for fusing glass you will be able to cut all manner of shapes. Stained glass is cut In the same way. Practice cutting straight and curved lines until you feel comfortable with the techniques.